Healthcare and Life Sciences organizations are adopting cloud-based workloads at a significant pace. A 2017 HIMSS study found that 65% of Healthcare organizations were using cloud-based services, and nearly 88% of those organizations were utilizing Software-as-a-Service (SaaS) solutions, which have become the preferred deployment method for many clinical application vendors. 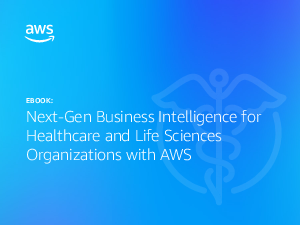 This eBook highlights advantages of using AWS to create and maintain cloudbased Next-Gen BI Solutions for Healthcare and Life Sciences organizations. This includes use cases from diverse organizations that have utilized AWS and APN Partners to manage and analyze data, and to discover insights otherwise obscured by the sheer volume of available information. Solutions from APN Partners can help your organization take the next step in building robust processes for making data-driven decisions that improve patient care, organizational processes, and innovative product development efforts.